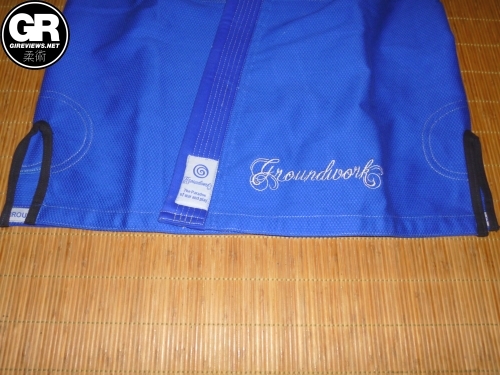 This solid training gi is the very first offering from the company, Groundwork. 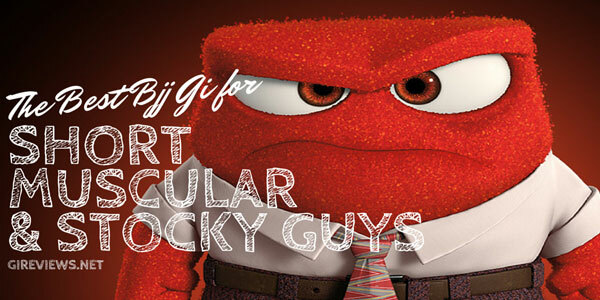 If it were a BJJ player, it would be a good purple belt. He may not know the berimbolo or how to leg drag, but he has a solid knowledge of basics. However, he still has a lot of work to do to get to the next level. Overall, this gi is really well made, but with a much slimmer cut around the midsection of the jacket and the pants. 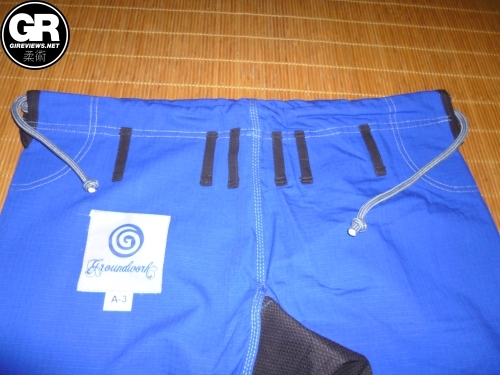 The branding and design is not on the level of the top brands out there, but the gi comes with two pairs of pants. 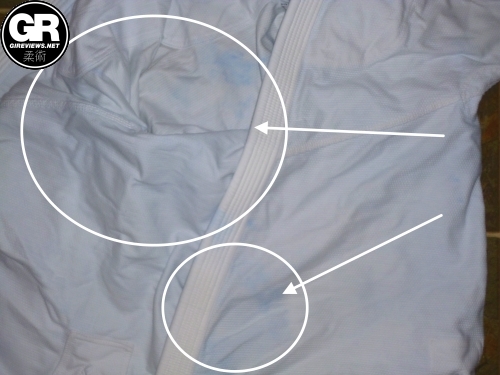 The coloring bled in the wash toward the end of the review, ruining another gi making it very difficult to recommend this over other similarly priced gis. 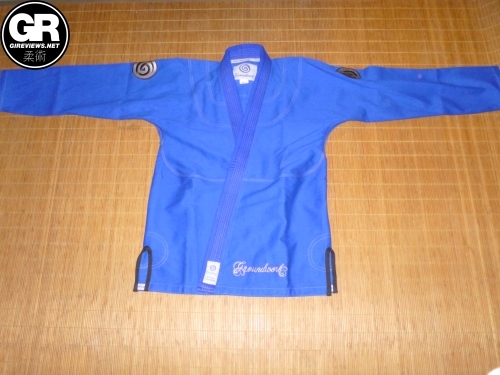 The fit of the jacket on the A3 Groundwork gi is awesome if you are around 6 feet tall and under 200lbs. 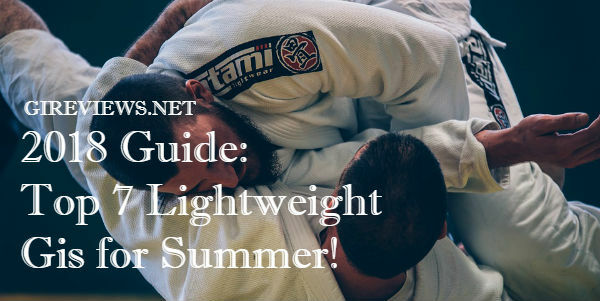 The recommended top range for weight is 210 and that is DEFINITELY accurate for this gi. If you’re over that, you’re going to have to pull the midsection super tight just to get it to close. Despite that, the upper back is very roomy and I had no problem at all with shoulder mobility while rolling. The sleeves, while not as narrow as my Scramble Athlete, are still very nice and did not succumb to the dreaded ‘wizard sleeve’ syndrome. For the pants, I ran into the same issue as the torso of the jacket. They were a great fit in the legs, but a bit too tight in the hips. I have very large thighs (thank you squats and deadlifts) and that’s where I carry a lot of me weight so if you’re a bit thinner in that area, they’ll likely fit you just fine. 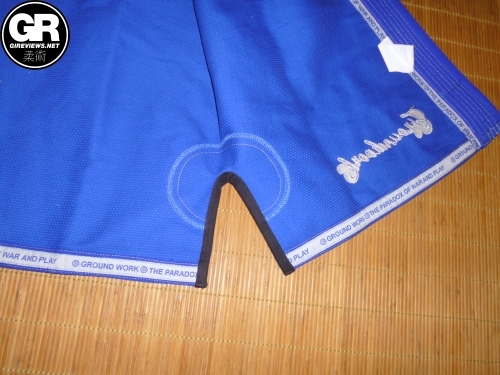 Design is always a matter of taste and I’m not a big fan of the design on the gi. I like the vortex image that also makes a G, lending itself to the brand name. Probably my favorite part of the design is the black contrast gusset. Contrast gussets are always a favorite of mine when well executed. The black and blue of the pants actually reminds me of my Bull Terrier New Star. 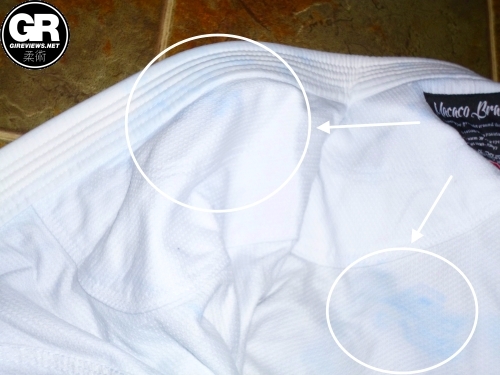 For the majority of this review, I washed this gi by itself (I always wash gis right after I wear them, thus they’re the only thing in the wash). 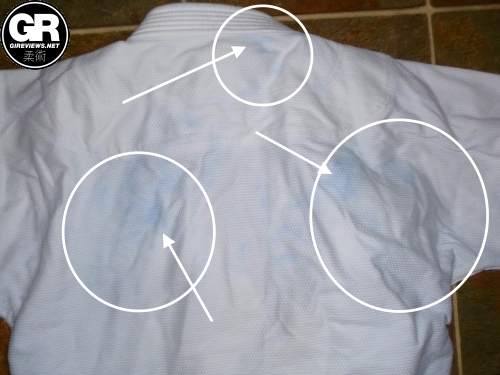 But, I was able to train twice in one day and threw two gis in the wash at the same time. 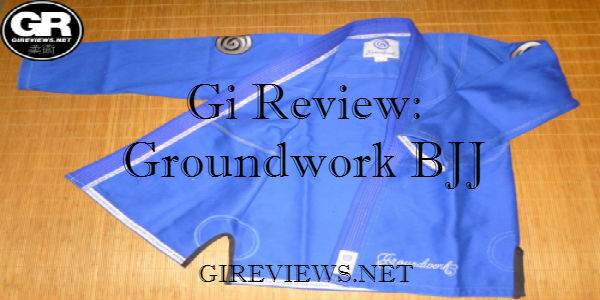 I took them out to hang dry and noticed that the blue dye in the Groundwork gi had bled all over the other gi. Honestly, I’m no stranger to having colors bleed in the wash. My first batch of OK Kimonos kids pants bled all over the place and had to be completely replaced before I could sell any of them. 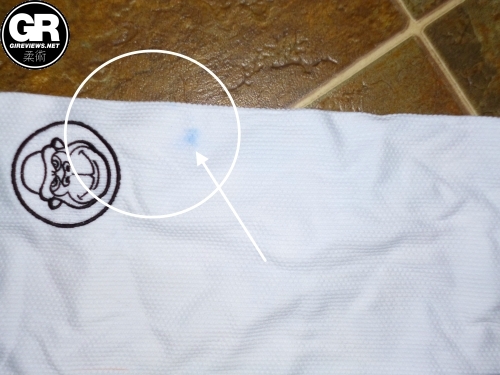 Sometimes this happens to new companies who use somebody off of Alibaba (like I did for that first order) but can happen to veteran brands as well if the factory decided to cut corners on a batch of gis. Essentially he said that this was my fault it happened and despite being asked, did not indicate how he would fix this for a customer. 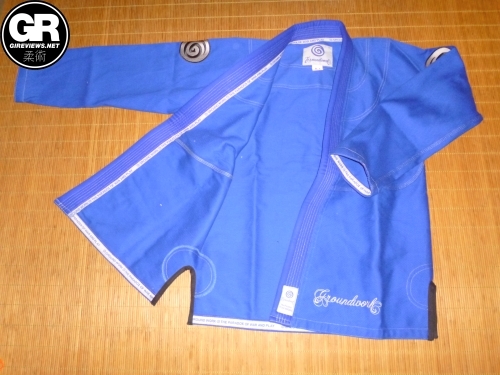 The jacket of the Groundwork gi is a 550gsm pearl weave. The jacket features embroidery on the lower front skirt and also on both sleeves. The gi has cool reinforcements in around the side vents in a circular pattern. I’m not sure if this is more effective than other reinforcement types, but it’s nice to see something a bit different than the standard square or triangle. I have to say that I really like the cut on the Groundwork trousers. They’re really well cut in the legs, but a bit narrow in the hips for me. I’m actually wearing the ripstop pants as I write this. WHAT? 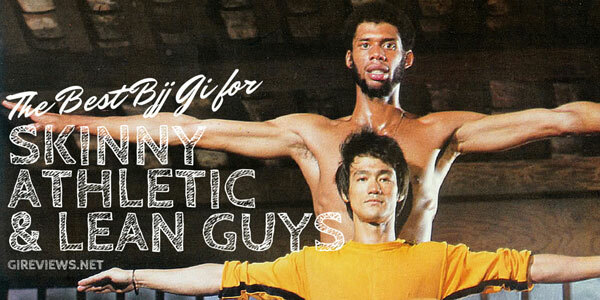 You don’t wear gi pants around the house? 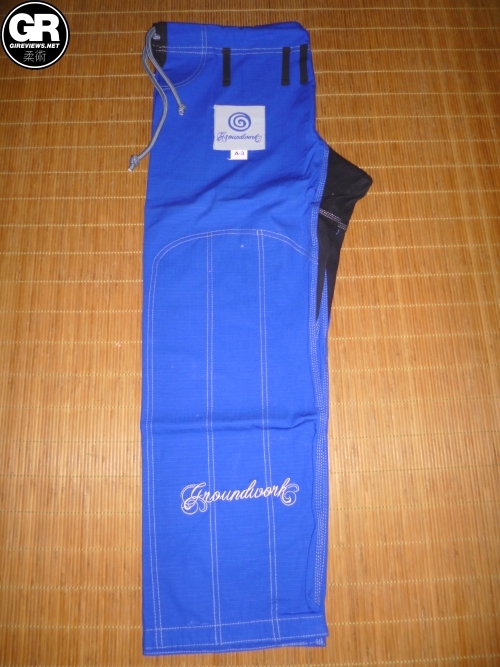 The Groundwork gi comes with two pairs of pants: 10oz ripstop and 10oz drill cotton. 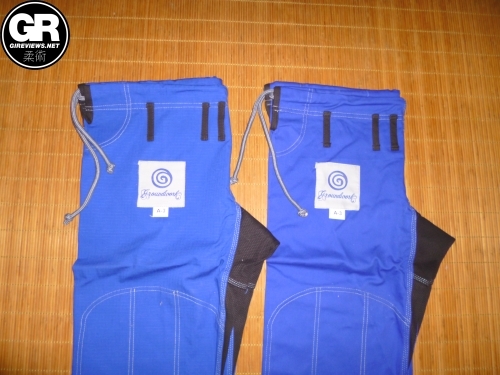 They feature a stretchy rope drawstring and 6 belt loops with full reinforcements throughout, including extra wide ones below the side vents. As a bit of a knee reinforcements snob, I really like that they reinforced the knees all the way down to the cuff. 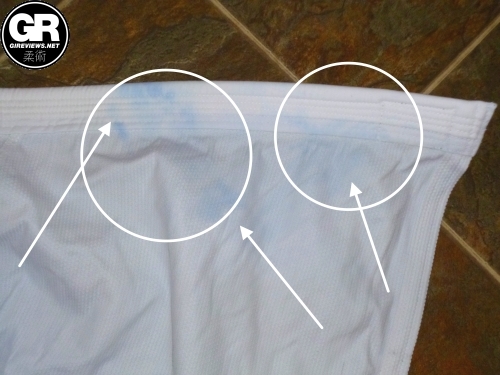 The main drawback of this pants for me is that one of the drawstrings exploded during testing. It was still functional, but the white interior popped out from the grey sheath. The biggest pro of this gi when rolling was definitely the collar. Despite being only a 550gsm top, this isn’t one of those sissy lightweight gis that’ll help you make weight at the IBJJF, but then get you choked in 5 seconds when you can’t break your opponent’s grip. The only downside was that despite the great cut in the lower legs of the pants, the crotch was a bit tight on me and reduced my mobility when stretching, playing guard, and passing. As I noted above, I don’t think this will be typical for all wearers. I’ve come to many of the same conclusions as Grapplers Review did. I really enjoyed the robust collar, but the fit was a bit wonky on me. 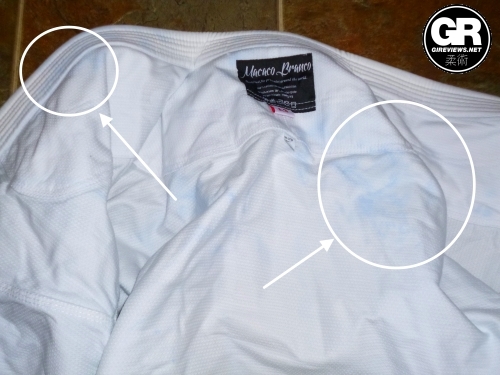 Again, I can deal with the drawstring exploding, but the biggest downside was the color bleeding everywhere and ruining another gi. I take that back, the biggest downside was customer support who dodged the issue of this being their responsibility and blaming the person wearing the gi. I’ve worn over 60 gis at this point and have not experienced a gi bleeding that badly onto another gi after this many uses. With a lot of gis that I review here on the site, I tend to overemphasize the aesthetics of the gi much more than the actual cut, quality, and construction. As a matter of personal preference (and as a person fascinated by branding and design), I’m very drawn to that aspect. I definitely stand by my assessment noted at the beginning of this review. 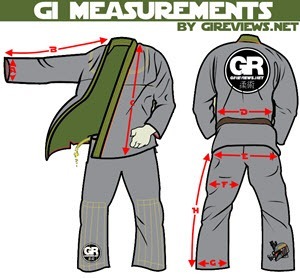 This gi has a lot of the basics down of what a quality gi should have. 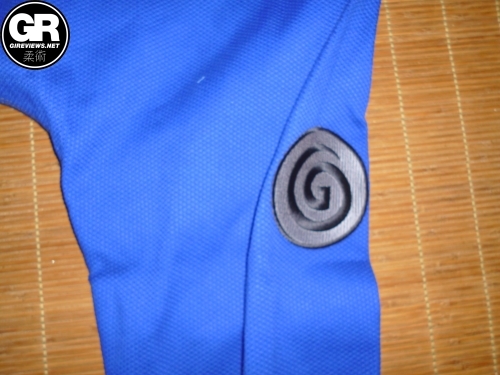 The flash and flair isn’t there on this gi, but that can easily be rectified on their next release. With that said, I tend to like gis that are designed very well, but my thoughts on Groundwork are quite the opposite. The branding and aesthetics of the gi don’t lend themselves to the price point, especially with the quality of the gi being what it is. 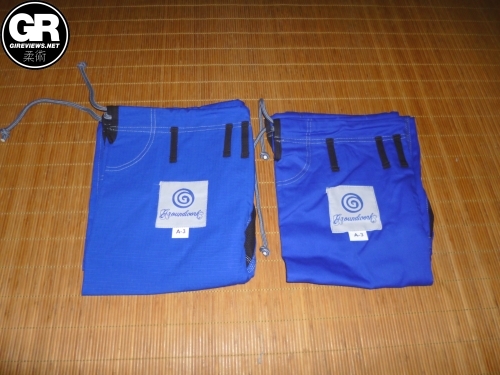 I also think that, despite having a gi bag and two pairs of pants, $165 (including shipping) puts them in the price range of Scramble and CTRL Industries which is very highly competitive. This is a bold move by a brand new company and I’m excited to see how they do moving forward. Hopefully they are able to fix the customer service, color bleed and drawstring problems as well.